The long-list will be created through a combination of seeded entries and self-nomination. To be in the consideration set please submit your entry here. The Digi100 will be announced at the Futurist Marketing Conclave taking place on August 18, 2017 at The Leela Ambience Gurgaon. The Digi100 is for progressive digital marketing leaders from both Agencies and Brand Owners. Applicants can range from CEOs of agencies with more than 50 employees, Digital leads, Account Directors, Creative Directors, Brand Heads, Digital Marketing Heads. The list is for residents of India. What will the Digi100 recognition entail? A structured level of recognition such as listing on paulwriter.com, a certificate and complimentary access to the Futurist Business Conclave on August 18, Gurgaon. As a part of the continuous outreach and engagement program, Paul Writer will produce the Desi Digital Cookbook, a collection of 18 articles on diverse topics with an Indian twist. “Continuous learning and re-education is important with the rapid transformation marketing is undergoing. Every profession stipulates continuous learning to maintain your professional credentials and marketing needs to evolve in that direction too. The Digi100 is thus designed to recognize not just today’s competence but also whether you are investing in your future, and that of your team. We are excited to partner with Pluralsight, the world’s leading technology learning platform for creative and information technologists on Digi100,” says Jessie Paul, CEO, Paul Writer. 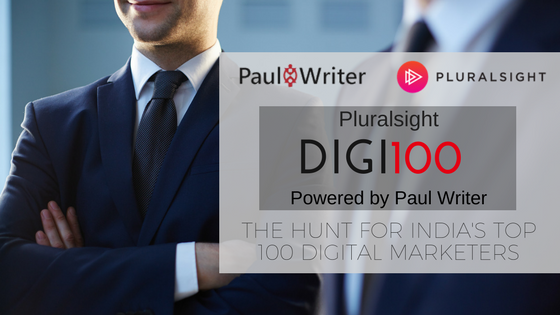 To know more about the programme please e-mail <sheetal.babu@paulwriter.com> or follow #Digi100 on social channels.